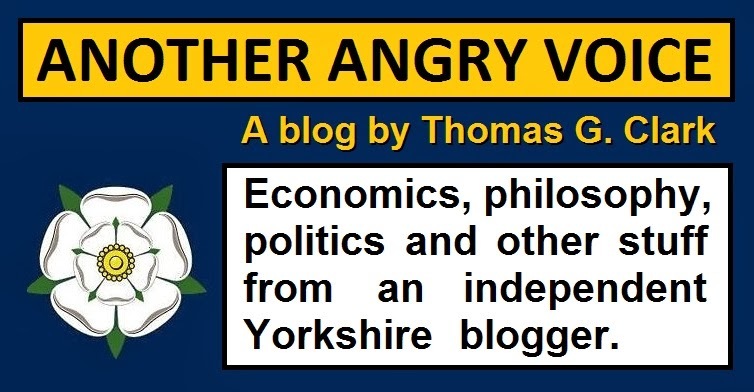 I began writing this blog in 2010 in order to express my opinions about current political, social and economic issues. I chose the name Another Angry Voice on the spur of the moment because I thought it sounded good at the time and I had to call it something. I don't believe it is a particularly accurate descriptor, given that I strive to to base my arguments on facts and analysis, and to include reliable sources, rather than simply writing emotionally fuelled rants. My blog is supported by "Pay as You Feel" donations meaning that I have the time to write and create infographics full time. A few more monthly subscriptions would afford me the financial stability to concentrate on writing my first book instead of simply creating content for the website on a full-time basis. I particularly enjoy demolishing pathetic arguments; the Political Myth Busting series is definitely worth checking out if you need some instant ammunition to comprehensively defeat an entrenched right-wing reactionary that is simply regurgitating the kind of asinine nonsense that they read in the Daily Mail, in lieu of actually engaging in political discourse. Not everything I write on this site is negative: The what is...? series attempts to explain complex economic terms in accessible language and the Case for... series outlines particular economic and political strategies that I favour. I also occasionally lapse into theological writing, these articles can be found in the God Debate series. I enjoy debate and strongly encourage people from all political persuasions to leave comments. I have an anti-censorship moderation policy, so as long as you remain reasonably polite (swearing is allowed) your comments will never be removed. I do however reserve the right to delete comments that are nothing more than extreme personal abuse, slanderous/unsubstantiated accusations, bigotry, or spam ("the use of electronic messaging systems to indiscriminately send unsolicited bulk messages, especially advertising"). Please don't hesitate to create links to your own website, or other interesting sites in the comments beneath my articles, as long as the link is demonstrably relevant to the article or the below-the-line discussion, it will not be deleted. Here is an article outlining my political stance. My blog also has a vibrant Facebook community with several thousand followers, feel free to check it out.